Its been a difficult summer for the bees here at Violet Town this year, and for a lot of inland Victoria. There has not been much nectar flow available for the bees to make honey with. The Murrnong bees have remained healthy, with plenty of pollen, and plenty of brood. It is lucky that we left plenty of honey in the hives, because the girls have kept consuming their stored honey even through summer, when we usually hope to see them bringing in fresh honey. 2015 saw only 280mm of rain here, way down from the 625mm yearly average, so it has been tough for the plants, and one plant survival strategy is not to flower in dry conditions. Mary from the February Backyard Bees course is holding up a frame of healthy brood. Some bee keepers have been moving their hives for better forage elsewhere, and some have been feeding sugar syrup. We were just at the point of feeling we needed to move our hives, when Grey Box, E. microcarpa, started flowering. Fortunately, with 125mm of rain here between Christmas and end of January, there seems to have been enough moisture available for the Grey Box to put nectar in their flowers. So.. phew, when we are around the hives, we can again smell the sweet scent of nectar and fresh honey. 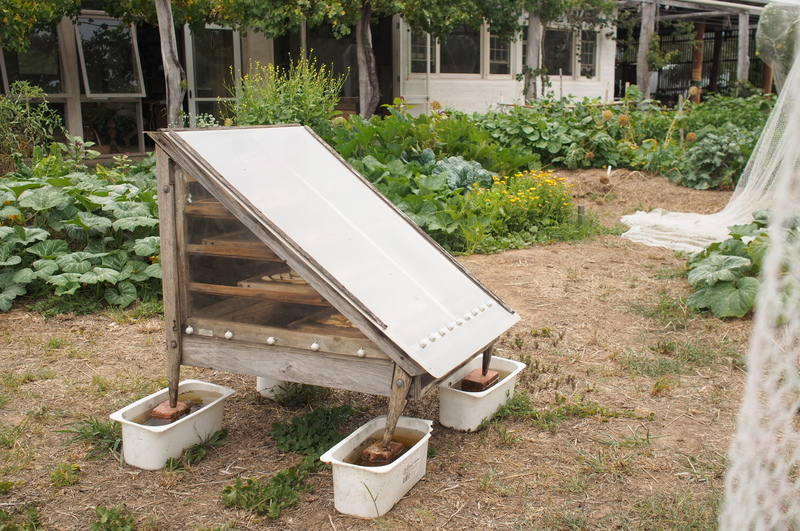 The next Backyard Bees hands on workshop is on Sunday March 20th. In this one day workshop we cover the basics of beekeeping, and consider some of the decisions that a small scale beekeeper makes. You will also gain some perspective and insight into how small scale and back yard bee keeping fits into the ecology of our food production. 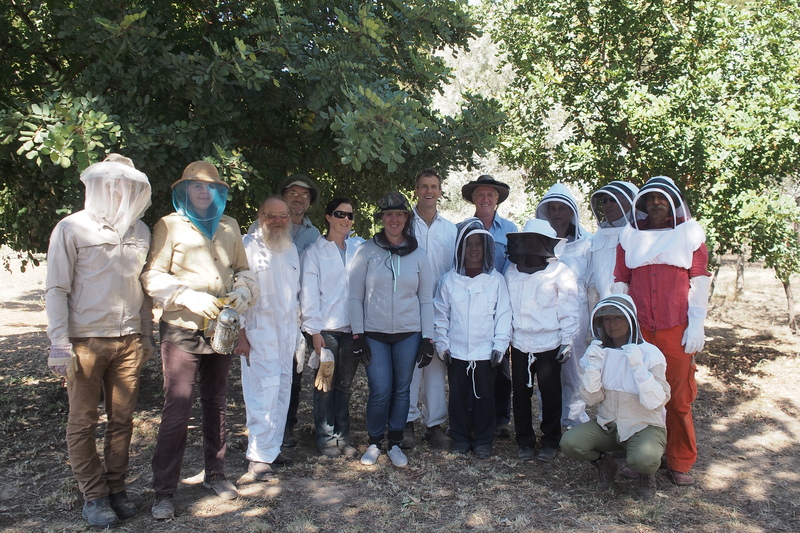 Together we will open some of the Murrnong hives, and learn to recognise what we see happening in there. 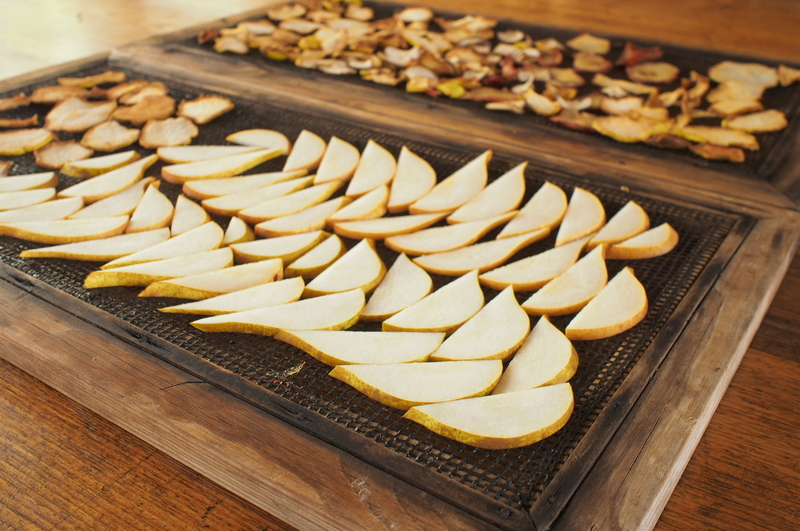 This is the second of these workshops this autumn, after the first one, on Feb 21st, sold out. 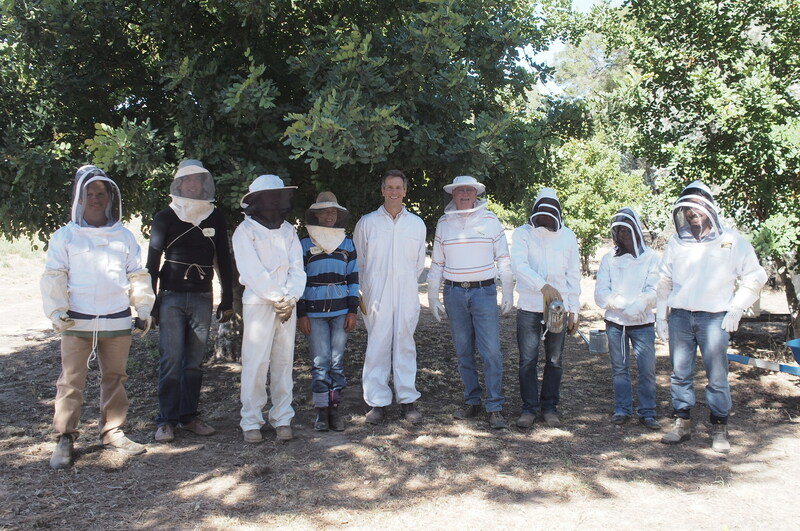 Here is a picture of the group dressed up and ready to head down to the hives. The calm warm autumn weather, with the bees busy foraging, made it an ideal and peaceful time to look inside. Keeping even just one hive of bees in your backyard can give a big surplus of honey, do wonderful things for the pollination and productivity of your garden, and can also help to make sure we have plenty of healthy bees for the future. A well placed and well managed bee hive, with the flight path out of people’s way, can be nothing but a positive. The first your neighbors might know about the hive you have had for the last six months could be when you give them a jar of honey. Bees are under stress around the world, bee numbers are down, the Varroa mite will probably get to Australia one day, and the neonicotinoid pesticides, so toxic to bees, continue to be used. Species diversity in large scale agricultural regions is now too low to feed bees through the year. 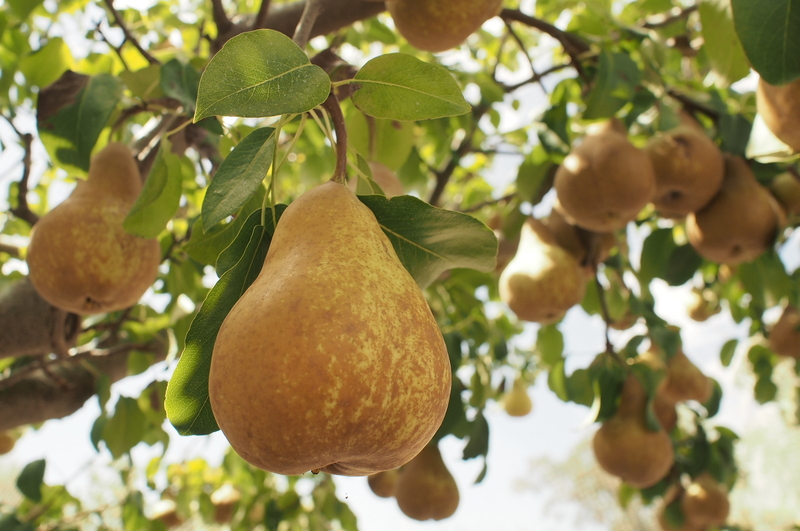 In the apple and pear orchards of south west China, bees have been eradicated by pesticide use and habitat loss, and people have to do pollination (the free work of bees) by hand, with a feather and little bags of pollen. In Australia, beekeepers are paid to truck their bees in to pollinate horticultural crops. There is species diversity in towns and home gardens, though. These are now an important bee forage resource. Backyard bees mostly feed from a different forage resource to commercially kept bees. The garden plants benefit, and we get the honey. Towns can provide a surplus of bees to support the surrounding agriculture or horticulture. Backyard bee keepers often collect ‘wild’ bee swarms, and so are potentially working with a broader range of genetics in bees than is possible when all the bee queens are commercially bred. This is important to allow for continual evolution and adaptation among bees. In Australia bees kept in backyards, or on rooftops in the city, generally have less exposure to insecticides than when bees are used for pollination in agriculture. With their smaller scale, less commercial pressure, and hives kept mostly in one place, backyard bee keepers have opportunities to experiment and innovate with their bee keeping practices. All of this can contribute to a bee keeping culture of continuous improvement, and a healthy increase in bee numbers. Ready for hive inspections at the Murrnong March 2015 Backyard Bees workshop. Kate Marsh and Ralph Nottingham of Creative Collectives are putting on an open consultation at their property near Eldorado, Sun Nov 29 2015. David Arnold will lead the workshop through the process of reading the landscape, figuring out how that land works, sift through their wish list to plan for functional connections, consider house site options, and develop a concept plan. And… what can they do about water? Kate says “Take the next step in learning about Permaculture. Come along and contribute to the planning of Hidden Valley Permaculture farm, Eldorado VIC. Our Permaculture Transformation is about to begin. 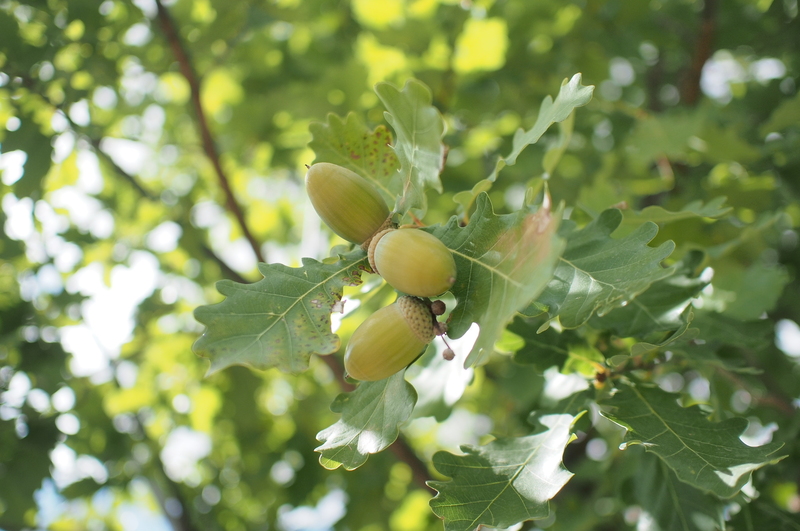 If there is a well established oak tree somewhere near you that you have admired, (and you live in the southern hemisphere) about now could be the time to collect some acorns and plant them. Don’t be put off by the moderate growth rate, the quality of the result in the longer term is well worth it, and you don’t have to hold your breath while they grow. We collected these acorns yesterday from magnificent old street trees in Violet Town. I propagate from old trees well proven in this climate and landscape. Our seedlings from these trees are just this year bearing their first acorns, in fact some of those are the lighter acorns in the top picture. 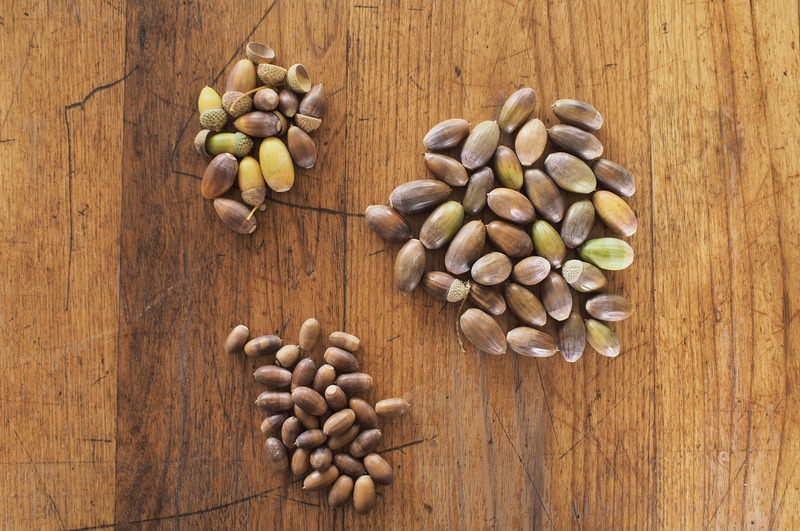 These particular acorns have been carefully selected for their freshness and firmness, for planting. Mostly we just rake the acorns up, remove most of the dirt and leaves in a big sieve, and store for goat feed over the next few months. The goats make their own firm decisions about which ones they will eat. The goats’ milk becomes more mellow, richer and creamier 24hrs after their first feed of acorns in the autumn. March 2015 Dappled light coming through the heavy shade of oaks planted here in 2006. The canopies are still small, but growing well. Heavy shade, soil improving qualities, fire retardant, beauty, and acorns for concentrated autumn fodder are why we planted these. These are possibly Algerian oaks. These trees are only semi-deciduous, staying green until the end of July, going brown in Autumn, then dropping their old leaves just as the new growth comes. This makes them well adapted to this relatively hot and dry climate, as they are able to make use of the usually more moist conditions in winter. We have been planting oaks here since 1996. We were collecting acorns for autumn goat feed supplement anyway, so it was a no-brainer to try planting them. This is the oak establishment method that has worked best here, on this farm in this climate. Autumn, approx March yr1. Collect or source acorns, keep in a damp cool place [eg in veg garden soil] or in a plastic bag in the fridge over the first winter. Summer, yr1 Grow in veg garden over the first summer. A couple of times over summer drive a spade about 30cm under the tree seedlings, to cut the tap root and encourage more shallow root development. Late Winter, August yr2 dig up from veg garden, prune excessively long roots, and plant out into spots or rip lines cleared of grass, with whatever compost you can spare. Spring yr3 Clear strong grass away from young trees again to give them a chance to grow with the Spring moisture and warmth. Nov 2006. 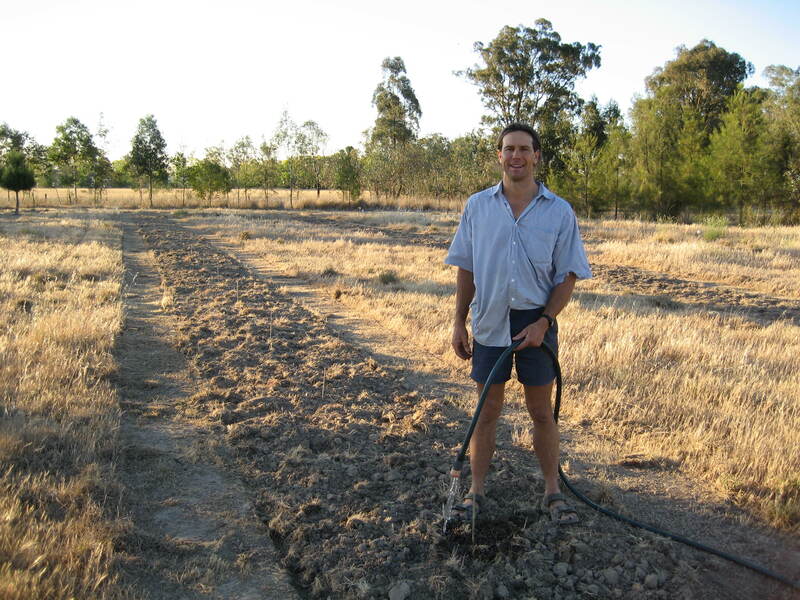 The first year of planting, David follow up watering in acorns seeded direct into rip lines, in a drought year…….. I must have been keen! That area looks a lot nicer now. The previous photo, of the foliage, was taken about 6m to the right from here. We have not tried leaching the tannins from acorns so we can eat them ourselves, but some friends do, and there is lots of information available about this, for example here.